• Healthy birds require a clean environment. Wash away any microorganisms that have grown happy in the warm weather. • Perches and laying boxes are often forgotten during cleaning. Birds spend a lot of time in these places and bacteria are plentiful! Don’t forget these spots. 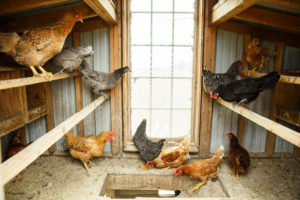 • Remove the bedding you use in your coop and replace with a thick layer of pine shavings, sawdust, or straw. • Pile the bedding up against the walls or leave a few bales of straw in your coop so if you need to remove some bedding during the winter during cleaning, you don’t have to haul fresh bedding in. • Piles of straw provide a warm place for chickens to cuddle through the coldest weather. • Don’t forget to place straw or other bedding in the nesting boxes. Soft, dried grass makes a great (free!) nest that protects eggs from cracking. • Chickens need a source of calcium all year, so don’t neglect providing oyster shells in winter. • To stimulate the scratching instinct and keep birds entertained, provide scratch grains periodically. • Drafts can cause respiratory problems and sickness in your flock. • Check for drafts where your chickens roost and spend most of their time when in the coop. • Make any repairs to your chickens’ house while the weather is still fair. • Develop a plan so your chickens have access to fresh, unfrozen water 24 hours a day. • Frozen water isn’t any fun. Set up your heating devices early so you’re prepared and safe. • If you use a heat lamp, make sure you have a spare bulb on hand and have safely located the lamp.